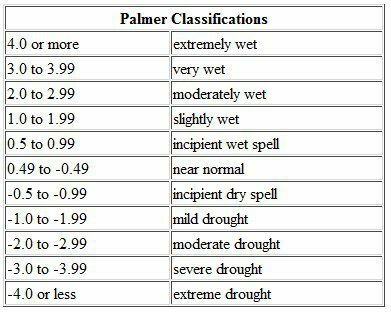 The Palmer Drought Severity Index is also abbreviated as PDSI. This index was created by Wayne Palmer (United States) in 1965 and measures the drought of a region taking into account both the quantity of water brought in (by precipitation and water courses) as well as the manner in which it is absorbed. This is a supply and demand principle which brings into play the humidity of the soil and evapotranspiration, for example. The index is obtained using an algorithm that integrates these different parameters. The index includes positive numbers (humid climate), negative numbers (drought) or zero, between -4 and +4.